Ben experienced first-hand the benefits of working hard. Did you have a favorite course? In Kim McGlynn’s American literature course, I loved reenacting scenes from the novels we read, like The Scarlet Letter. Taking a more active approach to reading helped me better understand what the author was saying rather than by reading alone. What did you get from a George School sport? Junior year I was a butterflier on the varsity swim team, and I learned that through hard work and practice, I’m able to better myself and make unique connections with my teammates. I couldn’t wait to be one of the captains for the winter season my senior year. 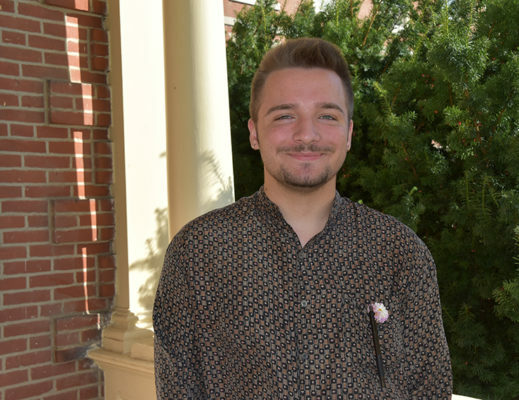 In addition to swim team captain, Ben held a number of other leadership positions: prefect in the freshman boys’ dorm, peer group leader, and leader of Open Doors (the gay-straight alliance), the Heteronormativity Task Force, and the Gardening Club. His other activities included teaching disabled children to play ice hockey and tutoring elementary students. At George School, he pursued painting and drawing to an advanced level and was in Senior Studio.